For the former Swiss municipality, see Montana, Switzerland. 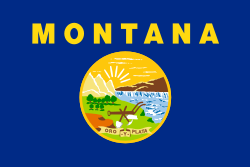 Montana is a state in the United States. Its capital is Helena, and the largest city is Billings. Montana has many mountains in the western half of the state. Most of the eastern part of the state is prairie. Montana and Canada share a 545-mile (877-km) part of the world's longest undefended (which means there are no soldiers or armies on either side) border. The state borders the Canadian provinces of British Columbia, Alberta, and Saskatchewan, more provinces than any other U.S. state. To the east of Montana is North Dakota; to the southeast is a short border with South Dakota. In the south is Wyoming, and on the west and southwest is Idaho. ↑ "United States Summary: 2010, Population and Housing Unit Counts, 2010 Census of Population and Housing" (PDF) (PDF). United States Census Bureau. September 2012. p. 41 (Table 18). Retrieved April 11, 2014. ↑ "Montana: Population estimates". U.S. Census Bureau. January 14, 2019. Retrieved January 14, 2019. ↑ 4.0 4.1 National Geodetic Survey 2008. ↑ 5.0 5.1 Geological Survey 2001. This page was last changed on 25 January 2019, at 23:24.